You can delete forms from either the mobile app or the web interface. Deleted forms cannot be restored by the user — if you need to recover a deleted form, please email support@goformz.com. You can delete forms individually, or bulk-delete multiple forms at once. In the mobile app: Expand the [...] menu next to your form in the Forms List or the Form Viewer/Editor, and choose the Delete option. Then tap Delete in the confirmation dialog box. For more details on how to delete a form on your specific mobile platform, refer to our Mobile App User Guide. In the Form Editor: Expand the Form dropdown menu and select the Delete option. Then click Yes in the confirmation dialog box. In the Forms Tab: Expand the [...] Actions dropdown next to the form you want to delete, and select the Delete option. Then click Yes in the confirmation dialog box. 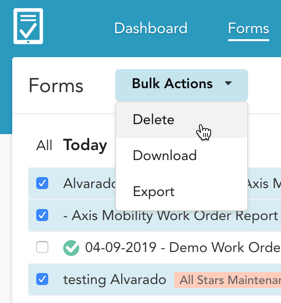 You can bulk-delete multiple forms at once in the Forms Tab. To do this, check the boxes next to the forms you want to delete. A Bulk Actions menu will appear at the top. Expand this menu, and click Delete. Then click Yes in the confirmation dialog box.